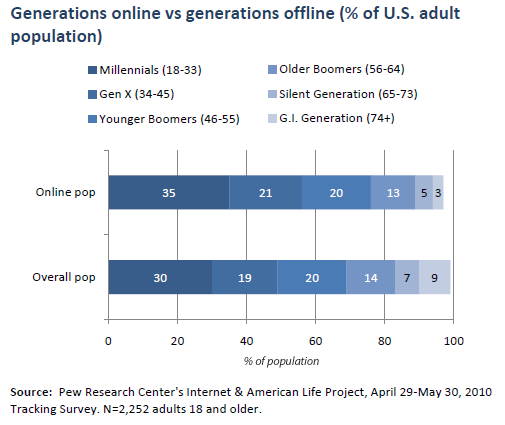 There are still notable differences by generation in online activities, but the dominance of the Millennial generation that we documented in our first “Generations” report in 2009 has slipped in many activities. However, internet users in Gen X (those ages 34-45) and older cohorts are more likely than Millennials to engage in several online activities, including visiting government websites and getting financial information online. Additionally, searching for health information, an activity that was once the primary domain of older adults, is now the third most popular online activity for all internet users 18 and older. 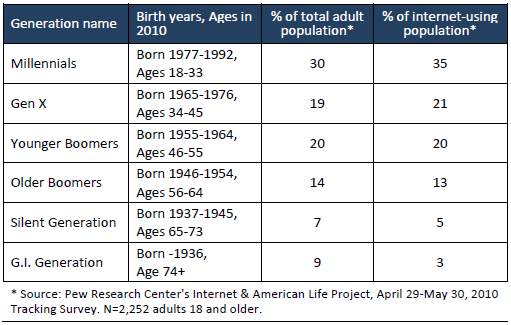 This is the second report by the Pew Research Center’s Internet & American Life Project exploring how different generations use the internet.1 All the generation labels used in these reports, with the exceptions of “Younger Boomers” and “Older Boomers,” are the names conventionalized by William Strauss and Neil Howe in their book, Generations: The History of America’s Future, 1584 to 2069 (Perennial, 1992). The Pew Internet Project’s “Generations” reports make the distinction between Younger Boomers and Older Boomers because enough research has been done to suggest that the two decades of Baby Boomers are different enough to merit being divided into distinct generational groups. This year, the Pew Research Center published a series of reports that more closely examined the values, attitudes and experiences of the Millennial generation, which generally encompasses teens and Millennials. These reports are available in full at pewresearch.org/millennials. Many of these reports also compare this younger generation to older cohorts. 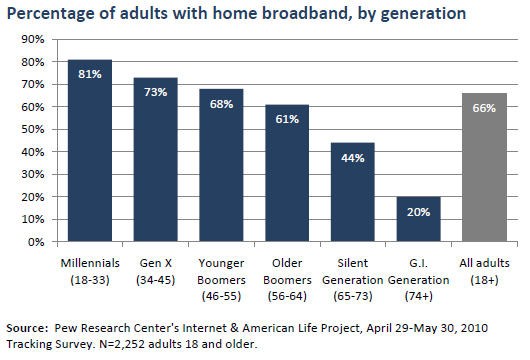 The primary adult data in this report come from a Pew Internet Project survey conducted from April 29 to May 30, 2010. The most current teen data in this study is from a separate Pew Internet survey of teens and their parents conducted from June 26 to September 24, 2009. For more information on these and other surveys cited in this report, including survey dates of all activities cited, please see the Methodology section at the end of this report. 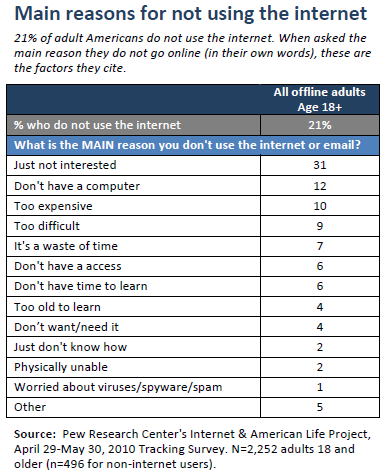 A plurality (31%) of non-internet users say that the main reason they do not go online is that they are simply not interested in doing so. Roughly one in nine (12%) cite not having a computer, and a similar proportion (10%) say that it would be too expensive. A full list of reasons is shown in the table below. 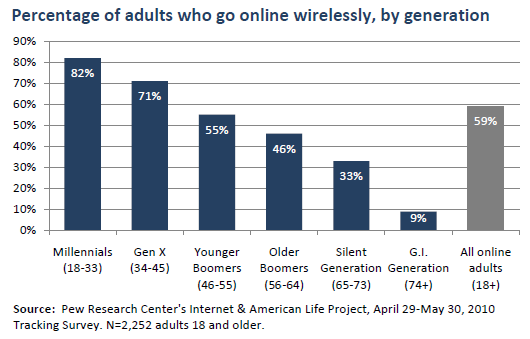 About six in ten American adults (59%) go online wirelessly, either through their smartphones or through a wireless card in their laptop.3 Adults age 45 and younger are the most likely to connect to the internet with a laptop, cell phone, or other internet-connected mobile device, as 82% of Millennials and 71% of Gen X connect that way. Only 9% of the G.I. Generation go online wirelessly.